I get emails often from people asking me if I know of a wireless tablet that has instant-on capabilities (doesn’t need to bootup) and can be used to control web-based devices. Well, I think I have found a product that might fit the task and the bill! The Pepper company is new to this space, but I’m sure they will be one hot tamale. The Pepper Pad weights only 2.3lbs and measures in at small, 12.1″ wide x 6.6″ tall and is only 0.8″ thick. It features a crisp 8.4″ touch screen display and not only does it have intergrated 802.11b wireless, but bluetooth support. Sure, most companies would stop there, not Pepper, they added even more spice… like a split QWERTY keyboard for fast text input and it is water-resistant… perfect for near the kitchen or even pool side. 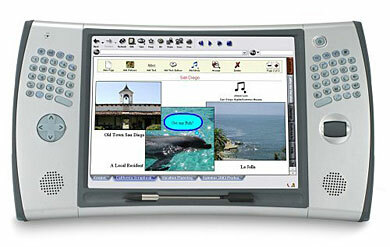 As for software, this isn’t a Windows CE based device so you won’t find the Internet Explorer browser, instead you can surf the web in confidence with the built-in open-source Mozilla engine (or Gecko Runtime Environment). It ships with a bunch of Pepper Applications like an email client, media player (view JPEG, PNG, and GIF images, listen to MP3, AAC, WMA and WAV files, and watch MPEG1, MPEG2 and MPEG4 videos), a instant messager client (AOL), a remote control application (control your TV and stereo equipment), internet radio, you can even play games on it! For the guys like me that like to write their own applications, the Pepper Pad application framework and applications are written primarily in Java and each application consists of one or more Pepper Pages which are XML, XSL, and CSS based so you can easily write your own. Overall, I think Pepper is heading in the right direction with this device. This is a great product for people looking for an all-around wireless web pad that can be used to control web-based home automation systems (Premise, HomeSeer, etc). However, due to the lack of Flash support, this isn’t something I can use with my automation system. But, I have a feeling that support for Flash isn’t too far away… (that’s for the Pepper guys… if they’re reading). 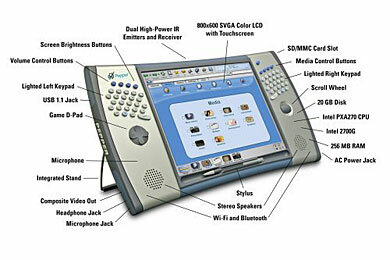 The PepperPad is shipping on June 28, 2005 and retails for $849.99. – Pre-order The Pepper Pad From Amazon.com for only $799! !